Hi Stampers! I hope you are having a great day. I am enjoying the view out my office window and I was the much needed rain. Today’s card is another card featuring the Stampin’ Up! Festival of Trees stamp set. I have paid it with an unlikely thinlit – the hexagon hive thinlit. I use this one much more in the spring with flowers, but it ended up working out well with this card. This card starts off with a Garden Green card base (8.5″ x 5.5″, scored at 4.25″). The hexagon Whisper White layer I cut using the Big Shot and the Hexagon Hive thinlit. Stampin’ Tip: When using thinlits that have lots of detail, you can save yourself a headache by using a layer of wax paper between the paper and the thinlit, when you run it through the Big Shot. The wax on the paper makes the thinlit release from the paper much easier. 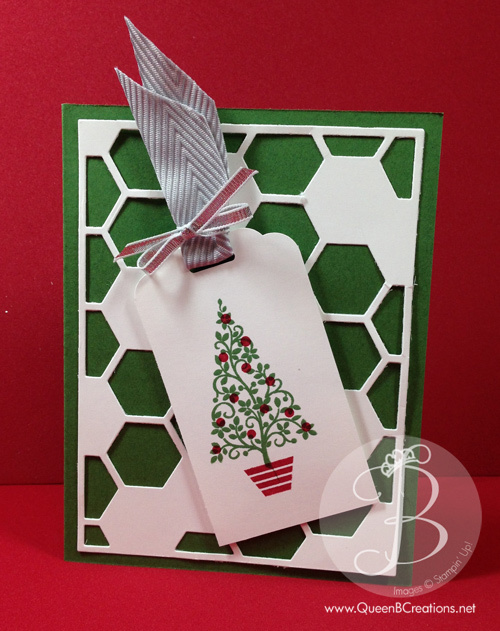 Next I used a 2″ x 3.5″ of Whisper White that I put into the scallop tag topper punch and punched the end. I then used the Stampin’ Up! Festival of Trees stamp set and stamped the tree in Garden Green ink and the decorations and pot in Cherry Cobbler ink. The finishing touch was a strip of 3/4″ Chevron Ribbon in Smokey Slate and a strip of 1/8″ silver ribbon tied at the top of the tag. The tag was then attached to the front of the card with dimensionals. All the supplies used to make this card will be listed below. They can all be purchased from my online store. Are you ready to start any Christmas shopping? Consider the gift that keeps on giving – a Paper Pumpkin subscription. Paper Pumpkin Prepaid Subscriptions are the perfect gift this holiday season-for friends, family, and yourself! A fully designed project kit will arrive each month with stamps, ink, and paper so anyone can skip to the fun.